The idea came during the Florida Legislature’s 2008 session, as a colleague and I were lamenting the dismal state of politics emanating from the capital in Tallahassee. 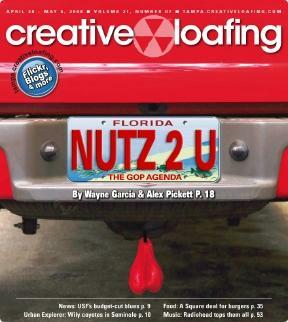 While the state’s residents dealt with critical issues like sprawl, unemployment and foreclosures, Florida legislators were spending precious time (and our taxpayer dollars) banning Bumper Nutz and saggy pants. I penned a tirade on the session’s irresponsibility. Thus, the “Bipartisan Guide to Ridiculous Legislation” was born. After my departure from the paper a year later, I decided to resurrect the series for the 2009 Florida Legislative session. I’ve since expanded it to cover other state’s silly attempts at law-making and, of course, poke some fun at the federal government’s absurdity, too. The Bipartisan Guide to Ridiculous Legislation looks for crazy laws from shortsighted lawmakers. The methodology is simple: visit legislative chamber websites, read each bill introduced and conduct some research. The Guide attempts to find bills that defy common sense and good public policy, and are not chosen along ideological lines. Politicians’ political parties only highlight the bipartisan nature of the Guide. Because, honestly, no political party corners the market on bad ideas. Read a complete list of posts here.